There will be many commemorations for Bannockburn 700 throughout the world, wherever Scots meet. Bannockburn near Geelong in Victoria, Australia also has its own battle re-enactment scheduled for 22 June. Here in Stirling the Masonic societies in the Provincial Grand Lodge of Stirlingshire have had a commemorative dinner for over 200 of their members. Two medals have been struck, both featuring the statue of King Robert the Bruce by the sculptor Pilkington Jackson, unveiled 50 years ago by Her Majesty the Queen. 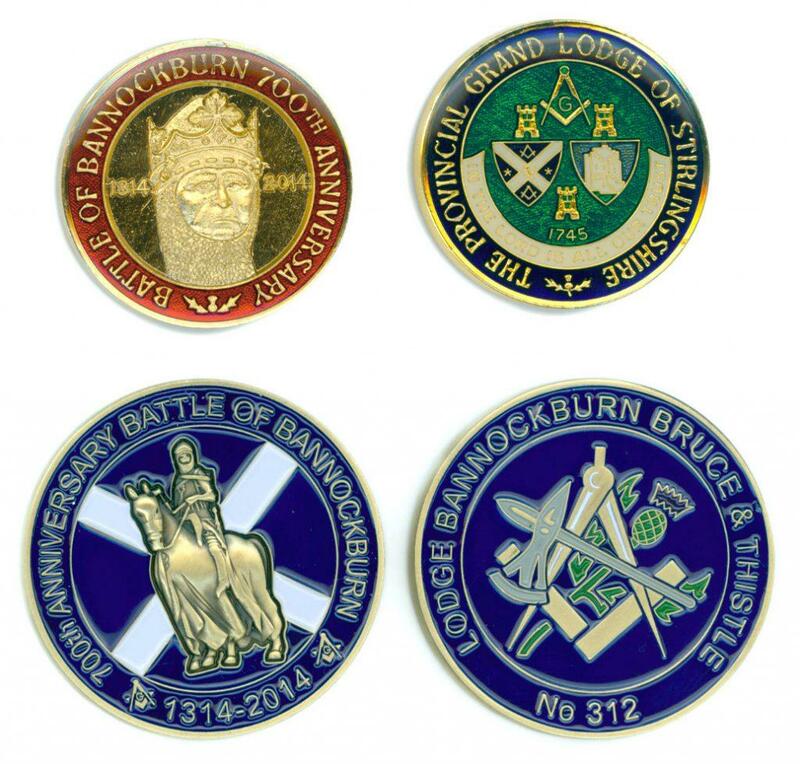 One is issued by the Provincial Grand Lodge, the other by Lodge Bannockburn Bruce and Thistle, and examples of both are in the Bannockburn exhibition at the Smith. The survival of what little remains of the battlefield is largely down to the Masonic community. It was the Loyal Dixon Lodge of Oddfellows of Dumbarton, with the help of the Stirling Oddfellows, who erected the 120 foot high flag pole in 1870. Before that, visitors had great difficulty in finding the Bore Stone where Robert the Bruce was said to have placed his standard. The supporting plinth of the Bruce statue, like the flag pole beside it, was dedicated with full Masonic honours and over a thousand masons present at the ceremony in 1964. Both the flag pole and the statue have been restored recently, and should be good for another 200 years, denoting the site of Bannockburn. Great! I am directly descended from the Dixons of Dumbarton after whom the Oddfellows Lodge was named.